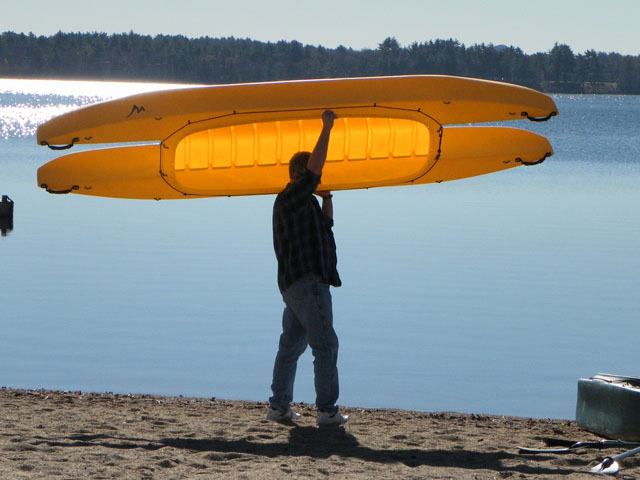 A two-person microskiff that you can paddle easily. No trailer required. The new 700 from Wavewalk is designed to serve as no-trailer, two-person microskiff that you can paddle easily by yourself or in tandem, car top with no help from a second person, and be stable, comfortable and dry fishing from, whether alone or with a fishing buddy. This unique combination adds an important dimension to shallow water fishing, as boat ramps are not always available where you need them, motorizing is not always an option in such fishing grounds, and poling is either too slow or too straining for traveling long distances. Its 92″ long (7’8″) cockpit is spacious enough for two large size fishermen to fish from in comfort, sitting and standing. Yet, this patented twinhull is narrow enough (just 31″), to allow for paddling over long distances, as well as poling, without experiencing stability problems. Other interesting features of this new microskiff class are its light weight (80 lbs without a motor), which makes it easy to car top, and load capacity (580 lbs, total). This new microskiff will be available in July. The new W570 series from Wavewalk is a great car-top, motorized solution for offshore fishing. 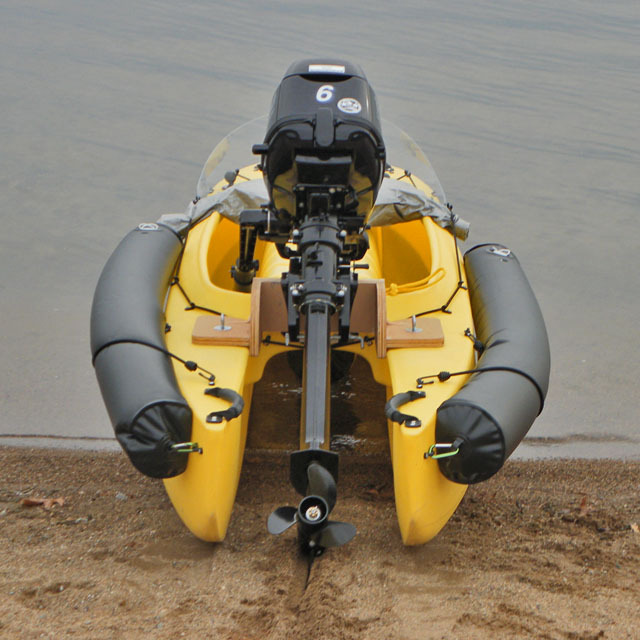 Models from this series feature a transom motor mount, a detachable spray shield, and a pair of high capacity detachable, inflatable flotation modules. Same boat viewed from behind. Note that the TMM 20-15 motor mount had to be reinforced so it could withstand the weight and torque of this powerful outboard motor. The W Personal Micro Skiff gets you anywhere a full size skiff would, and beyond, to fishing spots unreachable by other skiffs, jon boats, and even by conventional fishing kayaks. It offers you full comfort and control, both riding its jet-ski style saddle, and standing up. You can launch, go and beach anywhere, and never use a trailer or boat ramp again. One person can cartop this boat that weighs less than 60 lbs without the motor and detachable motor mount, and 93 lbs with a 2hp Honda outboard attached to it. Two of these personal micro skiffs can be easily uploaded and attached on top of any car rack, even that of a sedan. A pair of 2hp outboard gas motors fit in the trunk of any car. 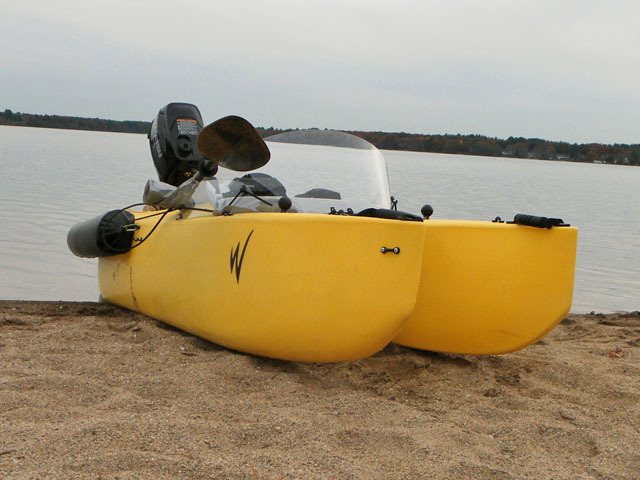 This personal microskiff outfitted with a 2hp outboard gas engine can tow another kayak or canoe behind at a 5mph speed. This option offers the owner to take with them other people on prolonged camping and fishing trips, as well as carry additional gear, for longer expeditions. 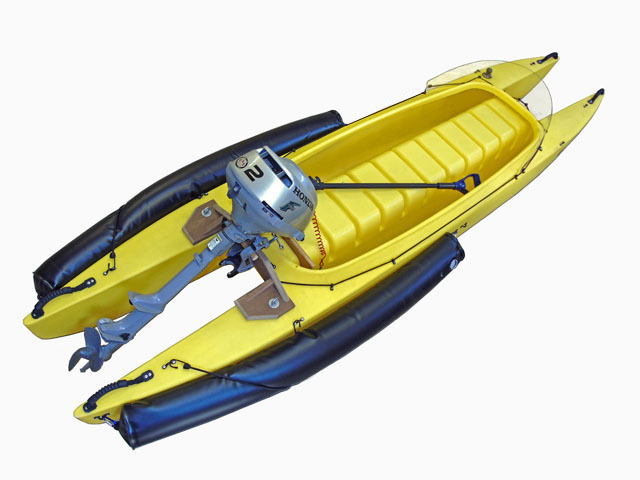 Wavewalk is a kayak manufacturer licensed by the US Coast Guard (USCG). This unique craft is an embodiment of our US Utility Patent Number 6,871,608 ‘Twin Hull Personal Watercraft’. Patented Twin Hull. 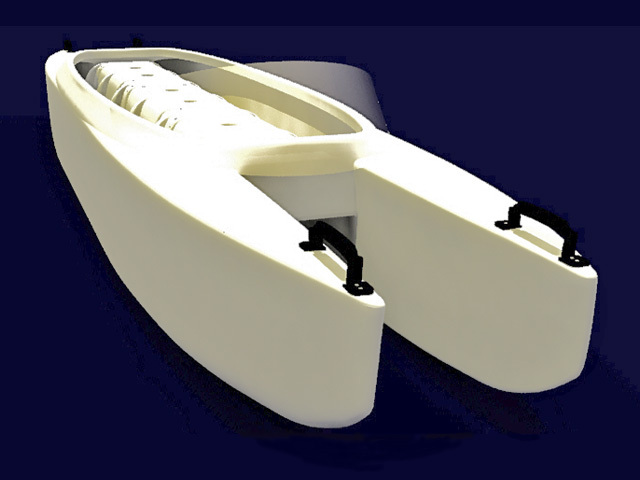 Catamaran Style Hulls With Longitudinal (Jet-Ski Style) Riding Saddle. Main Advantages: Unchallenged Stability, Dry, Most Comfortable, No back Pain. Unmatched Tracking. Comparable to a mid-size kayak. Length = 11’4″, Width = 29″, Height = 17″ (without motor). Weight: 60lbs (without motor), 93 lbs With 2hp Outboard Motor, Fuel and Motor Mount. Main Advantages: Fully Portable, Easy to Car Top. Launch, Go, Fish and Beach Anywhere. Recommended – 2hp 4-Cycle Honda Outboard with a 20″ propeller shaft. Works with outboard motors featuring 15″ propeller shafts as well. Other types of propulsion include electric motors, propane outboards, kayak paddles, poling poles, canoe paddles, rowing oars, and various sailing rigs. Main Advantages: Unrivaled versatility, No-Motor Zone (NMZ) Compatible when non-motorized. 1 Person Micro Skiff (Motorized) for Fishing, plus Kayaking, Canoeing, Sailing, and a Yacht Tender. Tandem: If the driver is not heavy, they may take an additional, lightweight passenger on board. Alternatively, when outfitted with a small outboard gas engine, this boat can tow a kayak or canoe with another passenger, at a 5mph speed. Main Advantages: High Performance, Full Service Micro Skiff for One Passenger. Unrivaled Versatility, Unrivaled Ease of Use, Unrivaled Mobility. Why choose a W Personal Micro Skiff over a typical micro skiff? The W Personal Micro Skiff offers you almost all the advantages you get from a typical, conventional micro skiff, plus some extra advantages in transportation, portability, mobility and versatility, and the only price you pay for these advantages is being able to take less passengers on board. How easy is it to transport a personal microskiff? It’s pretty easy, since the personal microskiff weighs just 60 lbs without a motor and motor mount. He’s seen going at 13 mph.